Call recording settings are found in Fastcall Settings > Admin Settings > Call Handling > Training Tools > Call Recording. You can turn call recording on separately for inbound and outbound calls. “Dual channel recording” splits the recording, so that one party is on the ‘left’ side of the recording and one on the ‘right’. This is useful for editing the recording. “Recording indicator in widget” displays a notification to the user that the call is being recorded. “Allow users to turn off recording” does what it says. “Delete recordings older than” allows you to purge recordings in line with your data retention policies. “Play disclosure” allows you to select a message to be played before the call starts. Call recordings are stored on Twilio, not on your Salesforce Org. 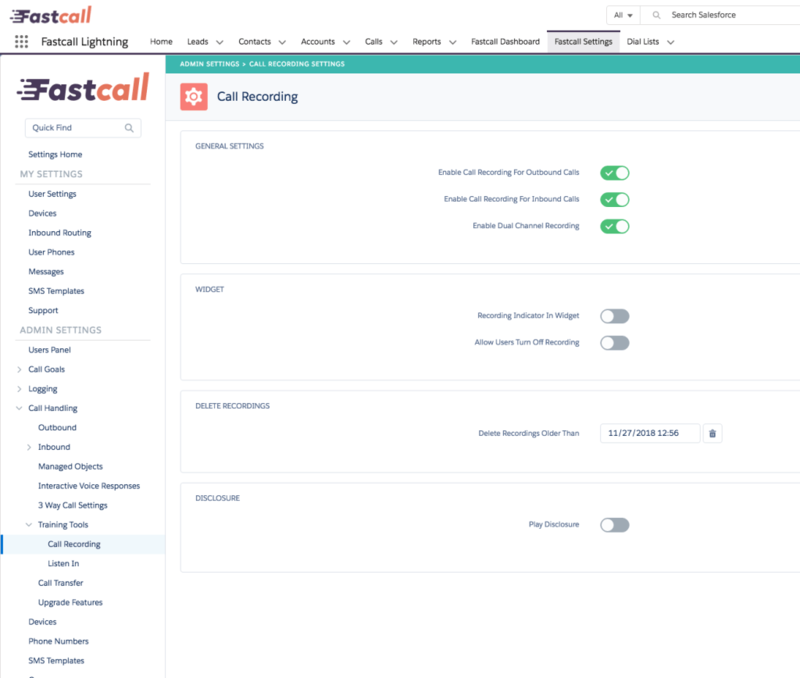 Fastcall puts a link to the recording into the call record on your Salesforce Org. By default, recordings have no access control on them. This means that anyone with the link can listen to the recording. Make sure you have understood and accept this before turning on call recording. You can limit access to call recordings via your Twilio dashboard by setting ‘Enforce HTTP Auth on Media URLs’, but this may interfere with voicemail messages and will make it impossible for your users to listen to call recordings without authentication details from Twilio.